Once again a Museum depot has revealed some startling surprises. This time it's the Staatliches Museum für Völkerkunde in Dresden. It's been concealing an almost complete Oriental Interior. The rediscovery of the Interior in 1997 was a sensation for experts around the world. Only in a few museums in the world is it possible to view other examples of this type of Ottoman Interior: A Room from Aleppo in the Islamic Museum, Berlin and a Room from Damascus in the Metropolitan Museum, New York. The Room in Dresden comes from Damascus. It was left disassembled in more than 110 pieces for over 100 years. Because of adverse circumstances and problems concerning exhibition space, the interior remained hidden. How did an Ottoman Interior make its way to Dresden? The fashion of the 19th century was called Orientalism for those individuals who were interested in all matters of the Orient. The Pumpenhaus in Potsdam (1841/42) and the Yenidze, the tobacco factory in Dresden, are manifestations of this movement. One of the collectors of the Orient was Karl Ernst Osthaus. In the years between 1900 to 1921 he operated as a patron of the arts and cultural reformer. In 1898 he traveled around the Orient collecting hand made artworks in factories and bazaars. An Oriental Interior was also supposed to make up part of this collection, which he unavailingly searched for in all the great cities of the Ottoman Empire. Towards the end of his journey he passed the responsibility on to the German Consulate in Damascus. They in turn, assigned the task to the photographer, Hermann Burchardt. It was Burchardt, who had been living in Damascus since 1893, who had found an Interior, which had met their expectations. The wooden wall and ceiling panels were disassembled, packed and sent to Germany. Back in Germany, Osthaus was mingling in contemporary art and architecture circles. When the wooden pieces finally arrived in Hagen, the pieces were put into the attic of his villa, where they were quickly forgotten. It was only after Osthaus' death in 1921, that the panels were rediscovered. One of the inheritors of the Osthaus estate was the art historian, Hellmuth A. Fritzsche, who came from Dresden. It was thanks to this individual, that the Völkerkunde Museum in Dresden, received the Damascus Room in 1930. At this time the collections of the Völkerkunde Museum in the Zwinger were to being shown. An installation of an Oriental Room would have made a grand addition, but the space provided for the Room was too small. Which later on proved to be fortunate, because the Room would have been destroyed, because of the eventual bombing of the Zwinger. Now the Oriental Room is going to receive an even more fitting environment: Dresden's Japanisches Palais (Japanese Palace). The Interior was made in the Turkish Rococo style, which originally comes from a Damascene residential house. 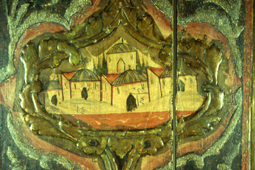 It is characterized by richly painted wooden panels. 1225, according to the Islamic calendar (1810 A.D.), is the year inscribed onto a piece of the collection, but the Room could be older. Today, it is very difficult to find this style of Interior in the Middle East. The usual life span of an Interior was no more than three or four generations. The Interiors were repaired, reconditioned, or the decorations were replaced. The military conflicts during this period only served to prevent the further preservation of this style. Most of the existing Rooms still found in the Orient have been heavily worked over (i.e. they were rebuilt or over painted and varnished almost without exception). With this in mind, the Völkerkunde Museum in Dresden has received an original wooden panel of great value. Most of the wooden pieces are fabricated from poplar wood and utilize peg and slot connections creating the frame system. The Room has an entrance door, two wooden lattice windows, a number of open compartments and niches, as well as four integrated wall cabinets. The poplar wood with the glued on carvings were overlaid with a coat of plaster and glue. The ornaments were applied with the help of a template and a little bag filled with coal powder. This created fine black outlines which were then painted in with a thick plaster and glue substance. This special technique is called Al Ajami. After this had dried the artists applied the four different metal leaf types: gold, tin, brass and copper. A specially prepared oil or glue was applied as a binding agent. After the polishing of the metal leafs, the interior surfaces were painted with flower bouquets, fruit bowls, stylized cityscapes, as well as floral and traditional geometric ornaments. The tempera and glue colours contain a preponderance of pigments derived from minerals such as the glittering orpiment, minium, cinnabar or mineral black. In addition, ancient recipes produced pigments like white lead, madder, indigo, and smalt. These pigments were partly used in a coarsely grained form to generate matt, fine glittery and at times velvety finishes. In this way the Room was elegantly and luxuriantly furnished. The play of light on the fine reflective metal leaf surfaces was further intensified by specially placed mirrors. How do the 110 single pieces go together? Since 1997, over 100 single pieces of the Damascus Interior lay strewn out in a room. In the beginning no one knew how to put the beautifully painted and carved panels back together. Ulrike Siegel and Antje Werner, two students from TU Dresden, accepted the challenge of putting the giant puzzle back together. They measured the qualities of every single piece, drew them and meticulously documented every nail hole. With the help of the mass, the decoration, the joint and the number coding written onto the backside of the piece, the positioning of every piece could be clearly determined. Since February 1998, a model of the Room, ratio 1 : 10, has been exhibited in the Museum. The Damascus Room has a surface area of 4 x 5.5 m and is 5.4 m high. As seen in comparable rooms in the Orient, the wall panels only utilize 2/3 of the total height of the room. The upper parts of the walls are usually only plastered and whitewashed. The Room is characterized by two parts: the vestibule and the main room. The vestibule is narrower than the main room, which is also 40 cm higher. The last 200 years haven't passed without leaving its mark on the Room. Many of the wooden pieces have broken, have been eaten by worms, or have been damaged by climate changes. Large flakes of paint have fallen off, the metal parts have corroded and the mirrors have become dull. The strongly coloured paint work has been covered by millimeters of dust and mould. Some parts have been spattered with glue and oil colour. Along with the browned oil paint coatings, these are the things that had to be taken into consideration for the restoration work. The exuberant decorations are hardly recognizable under all the dirt. The goal of the restoration is to delicately bring the Room back to life. The flakes of paint will be meticulously reattached. Dust and mould coatings will be removed along with the removal of deformed layers of paint and the browned surfaces. Desolate wooden pieces have to be stabilized and the missing connecting pieces have to be substituted. The tiny white paint losses will be retouched with a small paintbrush. Step by step, the Room can be assembled with the help of a supporting structure and brought back to life. In this fashion, this Treasure of Ottoman Interior Design will be restored back to its former splendor.